It’s not extremely pleasant. You have to put on the heavy apron, hold a stiff piece of film in your mouth and sit really, really still while your dentist’s assistant takes x-rays. Is it really required? Absolutely! No question about it. 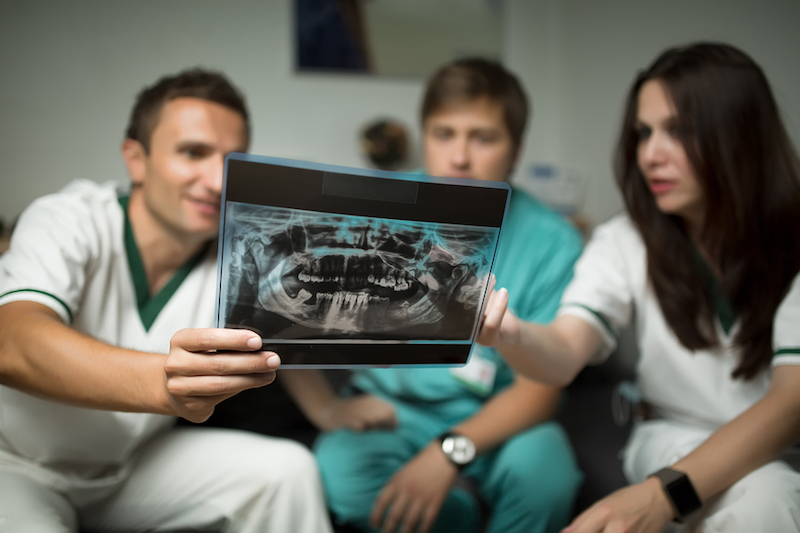 Your dentist can’t see everything that is going on with your teeth, bone, and surrounding tissue without x-rays. This depends on the patient. A patient with no history of tooth decay, no present tooth decay, no braces, and no existing crowns, veneers, or bridgework is at low risk for cavities. A high-risk patient is in the opposite situation and may have one or more of the following: a history of dental caries, existing restorations, braces, worn-away enamel, chipped or cracked teeth. In addition, patients with an eating disorder or other medical condition may be considered high risk. People who haven’t had their wisdom teeth removed also need to be followed with x-rays more frequently. If you are a patient of Rotem Dental Care, Dr. Rotem will counsel you on the frequency of x-rays when your treatment plan is discussed. If you are not a current patient and are looking for an experienced, friendly dentist in the Toms River area, we invite you to connect with us at 732-691-4944 to schedule a consultation. We look forward to meeting you.